Dan Horn Books (Los Angeles, 2014). The situation isn’t all negative, however. Forty-two new Catholic schools opened in 2013 in dioceses across the country, some of these in urban areas. Catholic schools now serve a more diverse audience than they did in earlier decades, with nearly 20 percent of students being racial minorities. 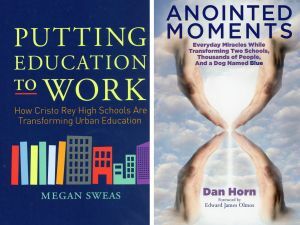 The books “Putting Education to Work” and “Anointed Moments” tell the stories of Catholic schools that have had success in serving these minority students in urban areas. “Putting Education to Work” provides an in-depth examination of the Cristo Rey network of schools, while “Anointed Moments” provides stories from the perspective of a Catholic school principal. Each school operates within “mission-effectiveness standards” created b the Cristo Rey national office. Several of these standards illustrate aspects that set Cristo Rey schools apart from other Catholic schools. For example, all schools in the network serve “only economically disadvantaged students” and each of these students is required to participate in an off-campus work-study program one day a week, with the wages from their work being paid to the school to subsidize the student’s tuition. In writing this book, Sweas interviewed students, teachers, administrators and board members from Cristo Rey schools in Boston, Houston and Los Angeles. Throughout the book Sweas uses these stories to “detail the structure of leadership in Cristo Rey schools, the logistics of the corporate work-study program, and effective teaching strategies.” The Cristo Rey network of schools is indeed impressive and those engaged in Catholic education of all kinds can learn much from a close examination of the stories told here. Under Horn’s leadership both schools thrived and won national recognition for their excellence. In “Anointed Moments,” Horn recounts stories of the transformation of these schools from struggling institutions on the verge of collapse into institutions of educational excellence. Horn’s stories are spell-binding. Under his leadership, the students of his schools have visited with Nancy and Ronald Reagan and Jimmy and Rosalynn Carter. Singer Helen Reddy has headlined a fund-raising concert, and Chuck D and Edward James Olmos are regular contributors to a Distinguished Speakers series that both parents and students are required to attend. Each year the faculty takes a week’s retreat in some faraway place, and students have had amazing experiences of their own. “Anointed Moments” is a self-published book and suffers from the lack of a strong editorial hand. Horn’s stories would benefit from strategic paring and an editor’s questions may have helped Horn to tell more about how he accomplished so much in such difficult situations. Nowhere does Horn tell how he succeeded, only that he did.